The long arm of the law has descended heavily on an operative of the Federal Special Anti-Robery Squad (FSARS), Charles Omotosho caught collecting bribe. An inspector of the Nigerian Police Force attached to the Federal Special Anti-Robery Squad (FSARS), Charles Omotosho, has been dismissed for extorting road users in Ikorodu area of Lagos State, a report by Premium Times has revealed. 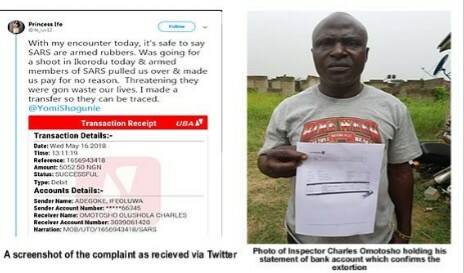 It was gathered that Mr. Omotosho’s dismissal came three months after tweets by a resident in Ikorodu, Princess Ife, who on May 16 claimed that the officer threatened to shoot at her and others, except they paid a ‘ransom’ of N5,000. Meanwhile, three months after the Public Complaint Rapid Response Unit (PCRRU) of the Police Force promised to investigate the issue and make findings of the investigation public, the SARS officer has been handed his sack letter. “Omotosho attached to SARS Ikorodu, Lagos at the time was found guilty of Corrupt Practices and Discreditable Conduct contrary to Para. C (ii) and E (iii) of Police Act and Regulations CAP. P19 LFN 2004. “Three other accomplices of the dismissed inspector were awarded punishment of reduction in rank from sergeant to corp0ral by the police. All @PoliceNG items (uniforms & ID card) have since been retrieved from the dismissed Inspector”, the tweet read. The police are, however, yet to act on two police officers caught on video collecting bribe from motorists on May 13 as reported by PREMIUM TIMES.